Artwork by Jill Schultz McGannon. Enjoy this cleverly packaged 2 photo album set. The Photo Binder includes 2 lignon & acid free binders that hold 100 photos, complete with binder inserts to customize your set. 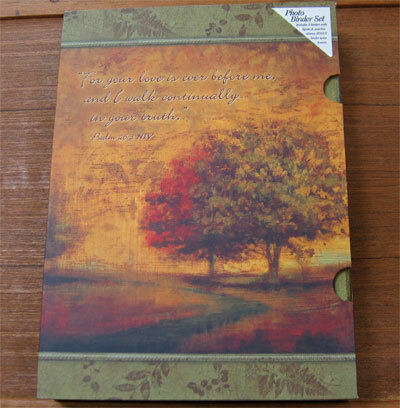 The front of the binder has Psalm 26:3 "For your love is ever before me, and I walk continually in your truth." The photo binder measures 10 1/2" x 7 3/4" x 1 1/4". 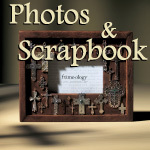 Each photo album measures 7 1/2" x 5" x 1" and holds 4" x 6" photos. Included in the ablums are customized spines that say 'Vacation', 'Family', 'Grandkids', 'Memories', and blanks to create your own.